Today’s preservation month post is inspired by the Millvale Musical Festival, which is happening on Saturday, May 13. Millvale continues to gain popularity as a destination for breweries, music, community projects and some impressive community events. If you are headed to Millvale then you need to know about the Maxo Vanka murals, which might be one of the best kept secrets in Pittsburgh. If you are headed to Millvale for the music festival, you might want to take a little break to check these unique works of art. Even if you are not headed to the music festivals, the Maxo Vanka murals are worth an hour of your Saturday. More details on visiting the murals below. 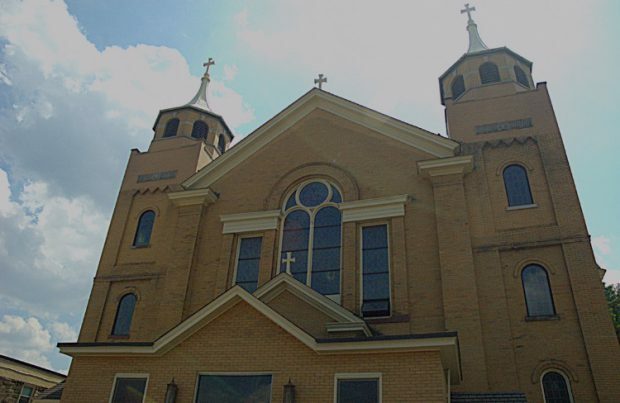 Photo credit: St. Nicholas Church website. From Route 28, St. Nicholas Croatian Catholic church looks like an unassuming church building that is tucked away on the bluff. Inside the church, the decor is anything but ordinary, the walls of the church are covered with 25 murals by the artist Maxo Vanka. What makes these church murals unique are the political statements found in several of the scenes. The Maxo Vanka murals have been compared to the works of Mexican muralist Diego Rivera and some of the murals of the Works Progress Administration artists. Croatian Mother Raises Her Son for War, Maxo Vanka, 1937. Photo credit: Society to Preserve Millvale Murals of Maxo Vanka. All of the murals can be viewed online here. 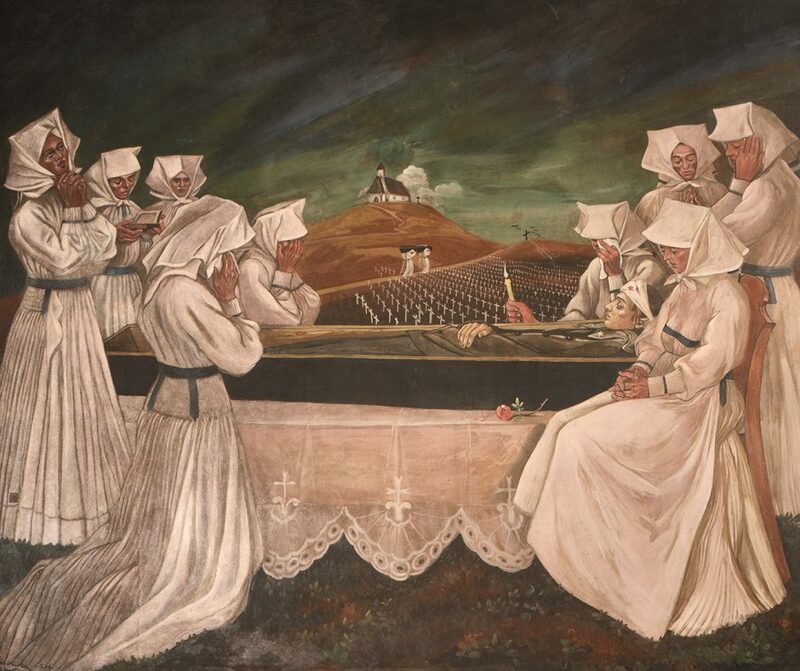 The other unique thing about the murals is that they have their own nonprofit that works to preserve, restore and promote the murals to an audience outside of the congregation. The Society to Preserve the Millvale Murals of Maxo Vanka was founded in 1991 and has worked to put the murals on the National Register of Historic Places. If you are interested in learning more, start with the SPMMMV website at vankomurals.org. Pittsburgh filmmaker Kenneth Love made a documentary about the murals in 2012, “Maxo Vanka’s Masterpiece: The Murals at St. Nicholas Church”. You can purchase a DVD of the documentary from the church. Docent led tours are held every Saturday at 11am, Noon and 1pm. Tours last about an hour. Note that tours may be cancelled or postponed due to parish activities. It is recommended that you register in advance for tours. Private tours are available on request. If you are visiting Pittsburgh on a weekday, be sure to reach out for a tour or if the church is open, you should be able to stop by and see the murals in person. More information on the VankaMurals.org website. The Society to Preserve the Millvale Murals of Maxo Vanka is also on Facebook. Detail of one of the murals in Coit Tower. Last November, I had the good fortune to visit San Francisco. San Francisco has a nonprofit, SF City Guides, that offers free walking tours of a variety of places around the city. Since it was raining we opted for the indoor tour of Coit Tower on Telegraph Hill. 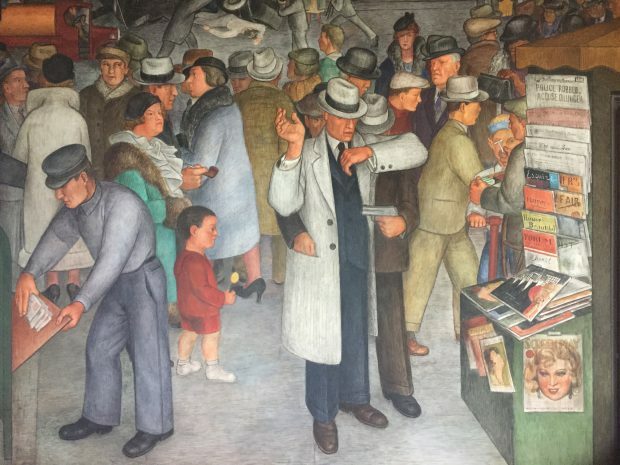 If you enjoyed seeing the murals of Maxo Vanka, I highly recommend a visit to Coit Tower to see the fresco murals from the Works Progress Administration artists. The skill of the fresco artists is impressive and these murals also contain many political messages.